A tintype, also known as a melainotype or ferrotype, is a photograph made by creating a direct positive on a thin sheet of metal coated with a dark lacquer or enamel and used as the support for the photographic emulsion. 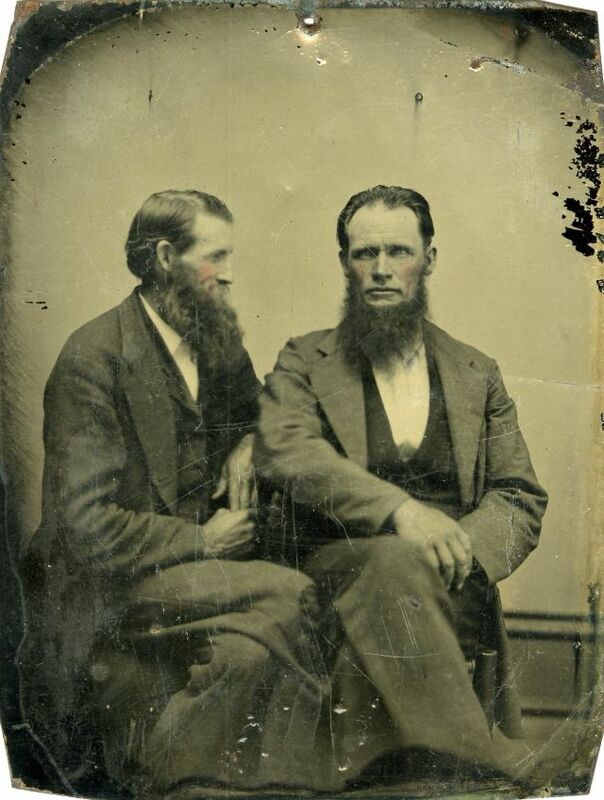 Tintypes enjoyed their widest use during the 1860s and 1870s, but lesser use of the medium persisted into the early 20th century and it has been revived as a novelty in the 21st. 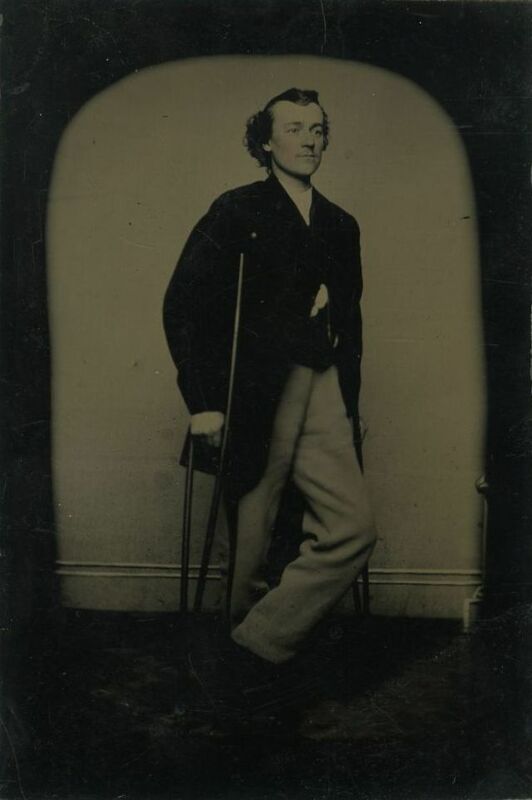 Although early tintypes were sometimes mounted in protective ornamental cases, like daguerreotypes and ambrotypes, uncased tintypes in simple paper mats were popular from the beginning. They were often later transferred into the precut openings provided in book-like photograph albums. 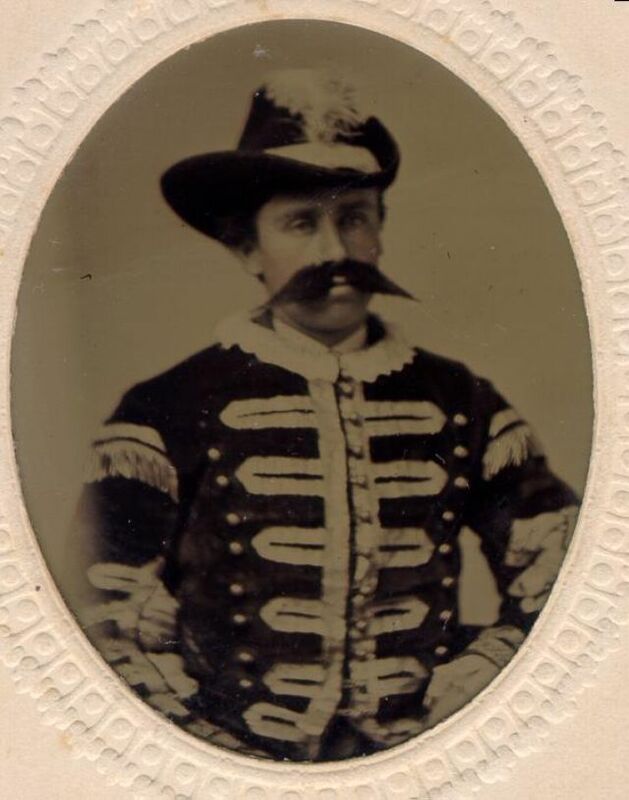 Mustachioed man in uniform, likely an actor of some sort. 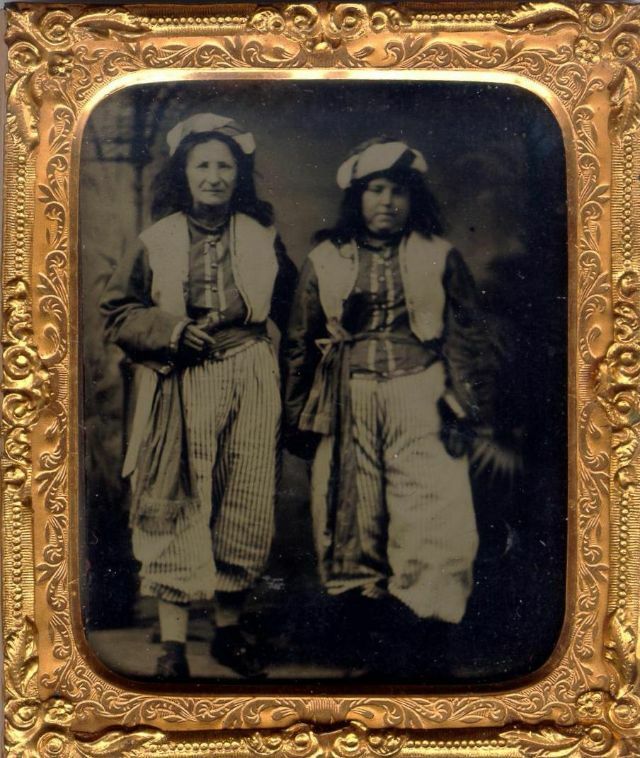 Two women in Zouave outfits. 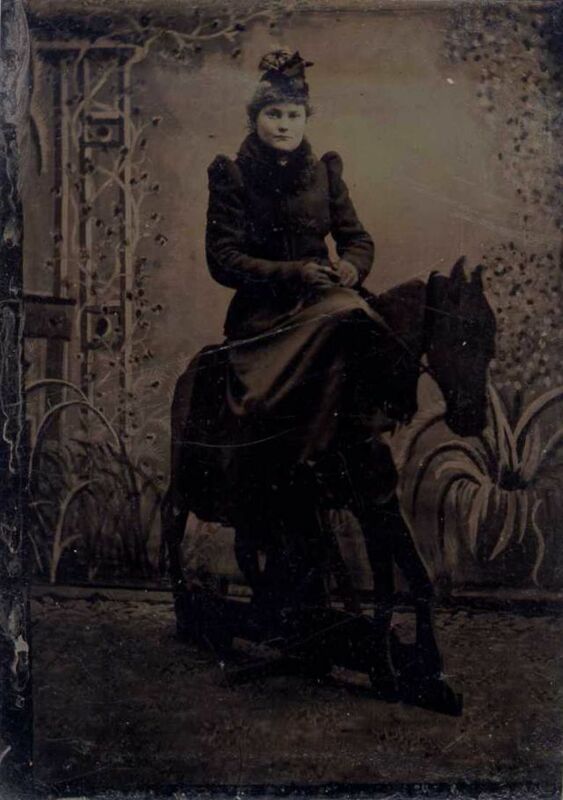 A woman on a prop horse in a studio. 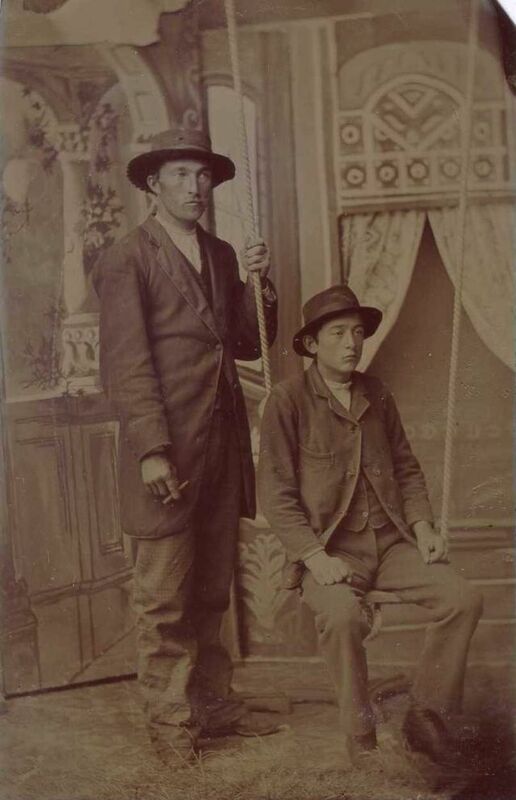 Two men, look like they are related, one seated on swing, one man has a cigar in his hand. Definitely odd. 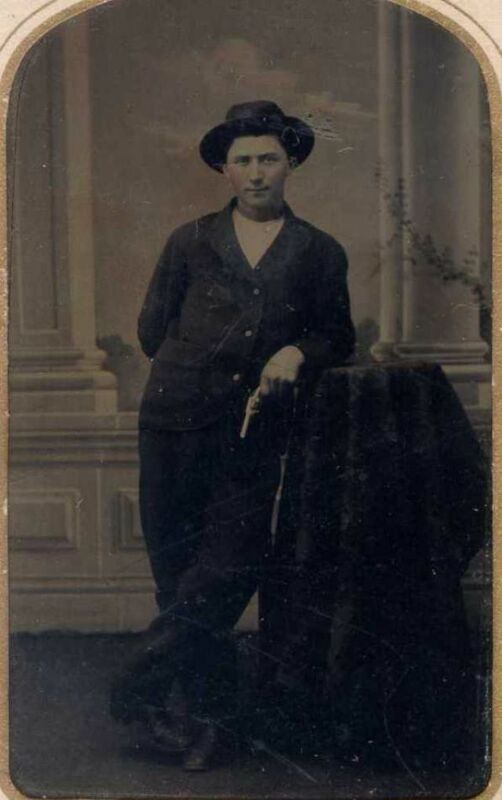 A young man holding a pistol. 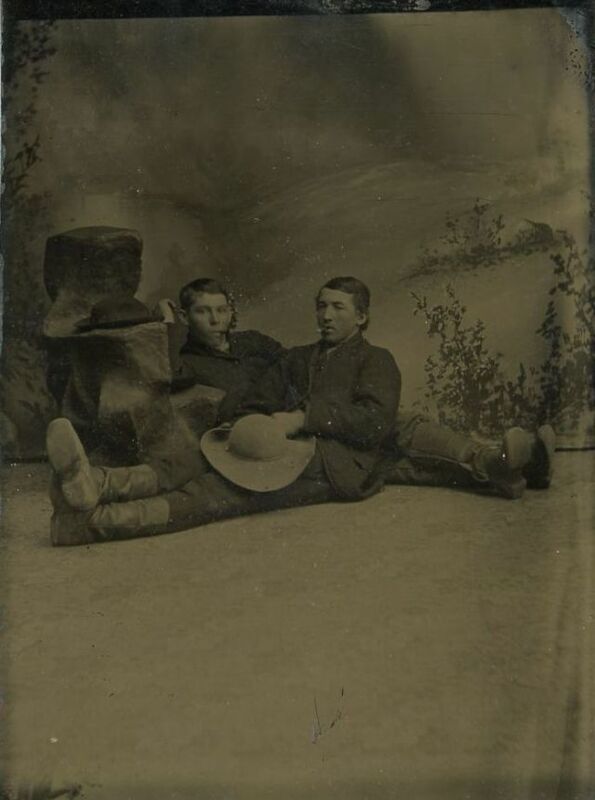 Tintype of two men. The man on the right wears a tunic, a garment worn by Roman men from the second century BC onward. The man on the left wears a long crimson robe indicative of high nobility. 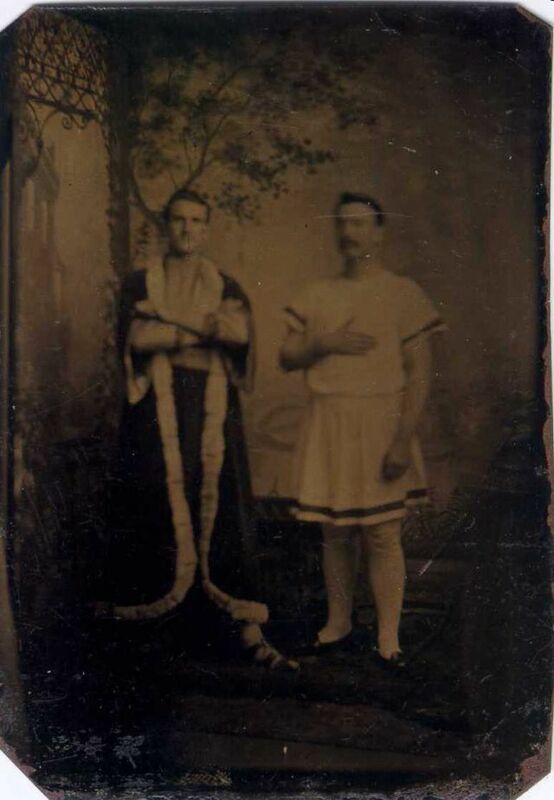 The tights are a standard costume accessory for 19th century thespians, worn even in period roles for which tights would be historically inappropriate, probably to meet the standards of Victorian modesty. 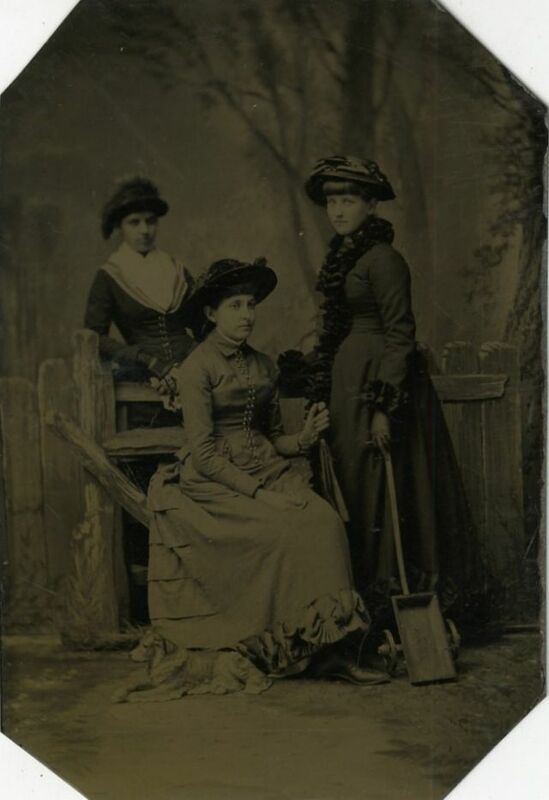 Three women, one with a toy wagon. 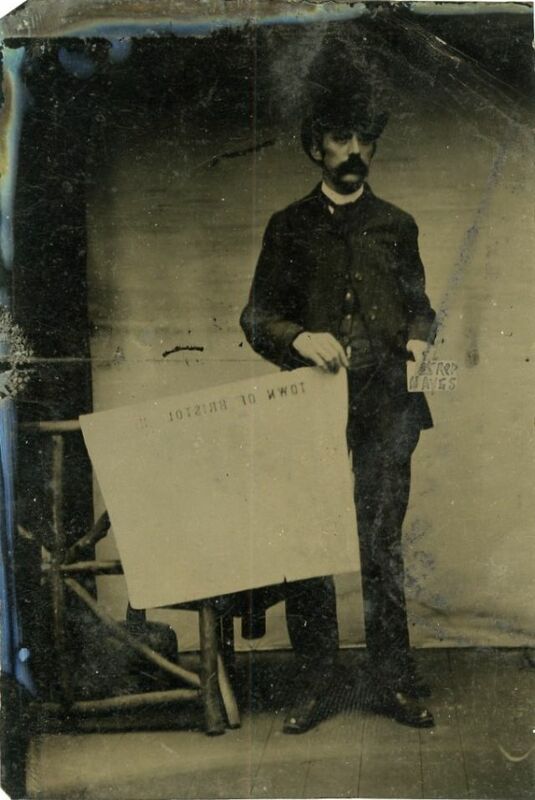 A political gentleman holding a map reading at top "Town of Bristol" and a sign for Representative Hayes. Two men with firearms, looks like a rifle and a double-barreled shotgun. Two serious looking young gentlemen. 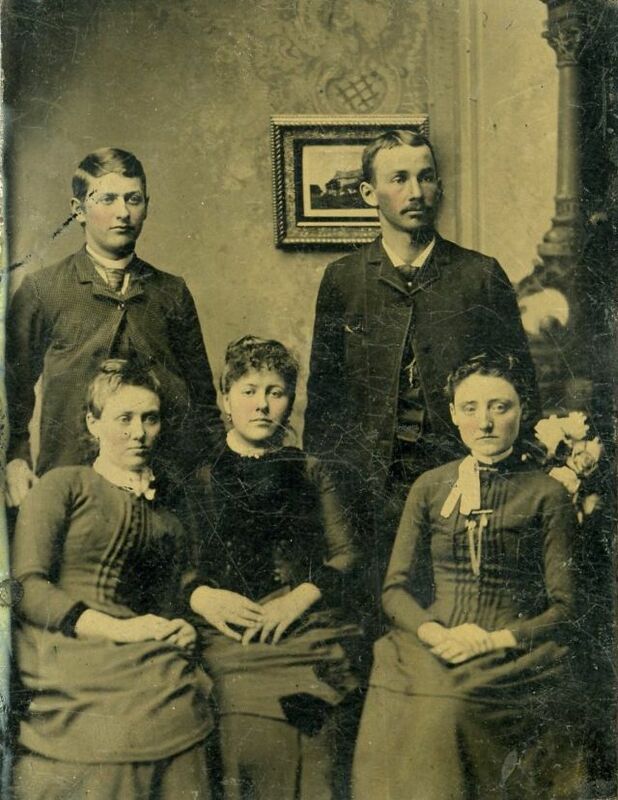 Tintype of posed group of 2 men and 3 women. 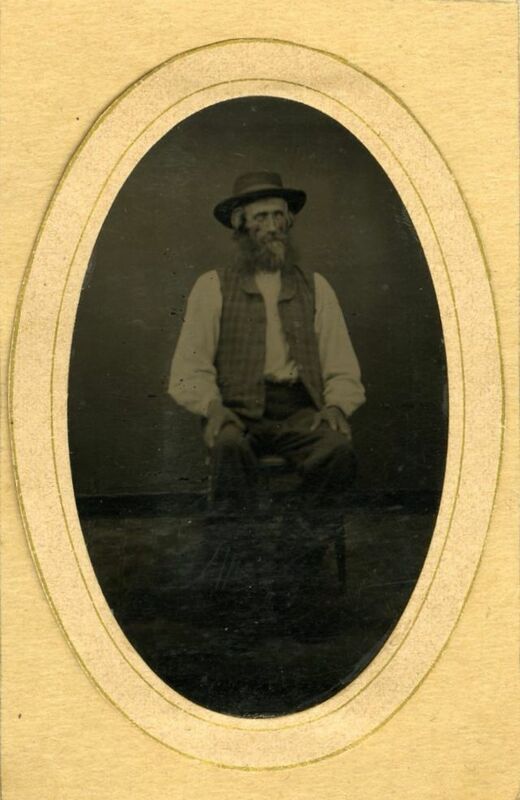 Elderly, bearded, seated man in vest and hat. 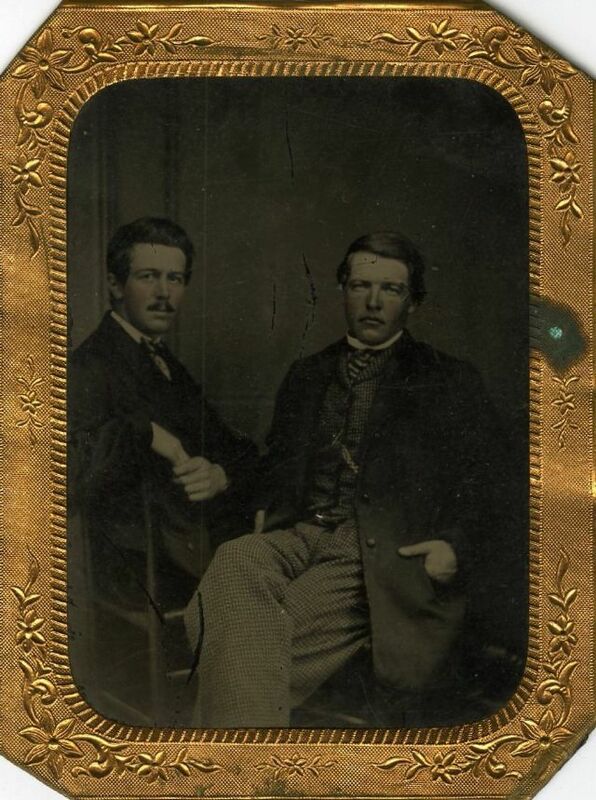 Tintype of David and Thomas Havens. 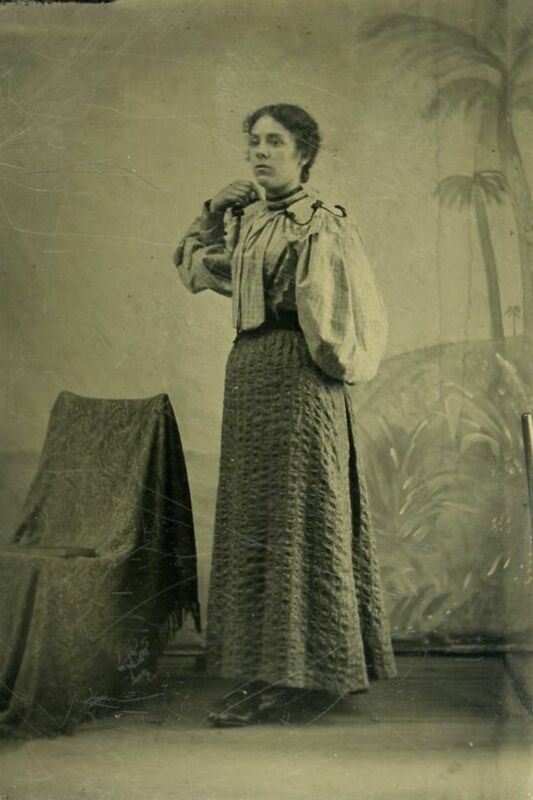 Tintype of a one-armed woman. 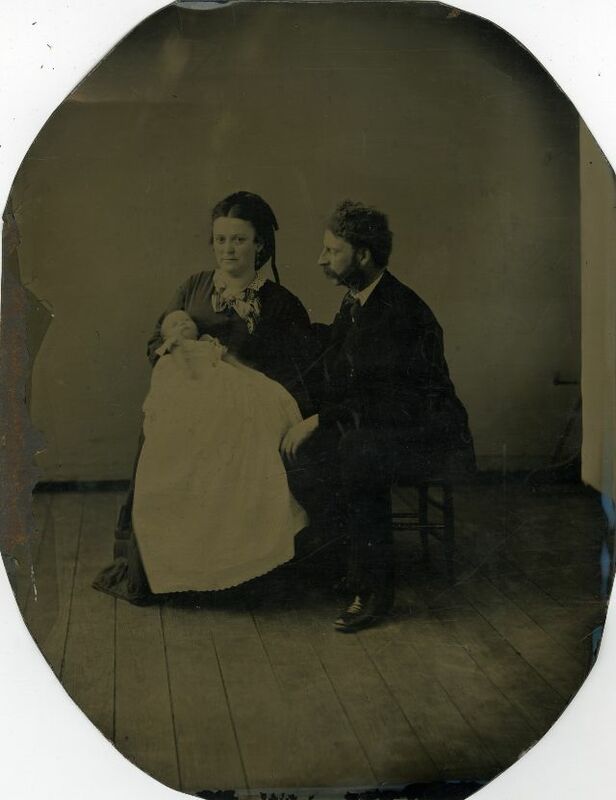 A couple with their sleeping baby. Probably a christening. 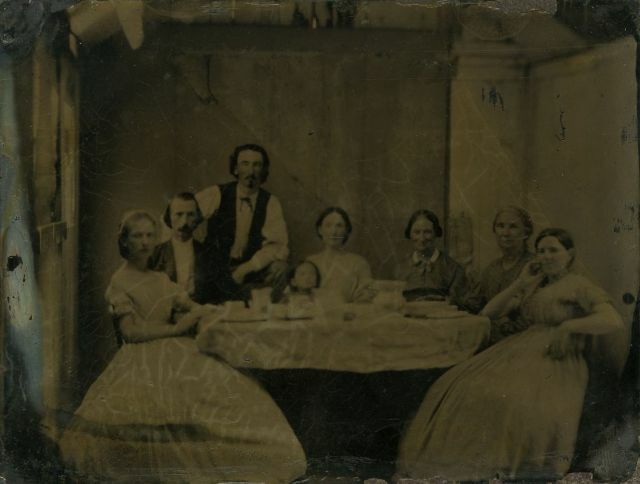 Quarter-plate tintype of a family gathering around the table for a meal. Unusual topic for a tintype. Could this be the photographer's family? We'll never know. 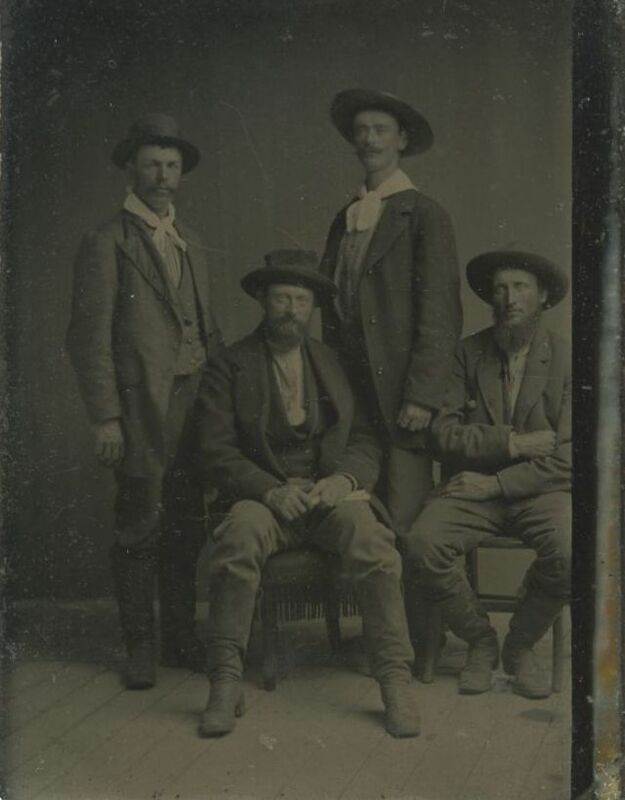 Tintype of what appear to be 4 cowboys in from the trail. 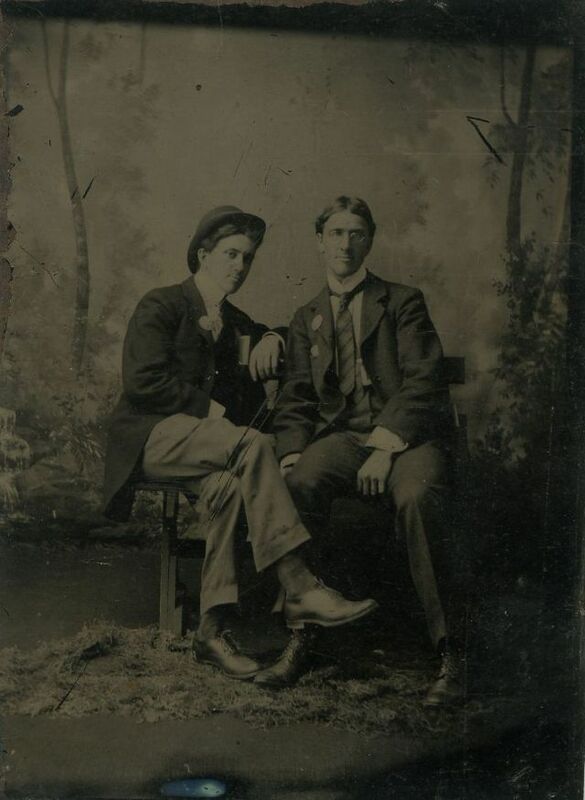 A pair of young gentlemen friends. 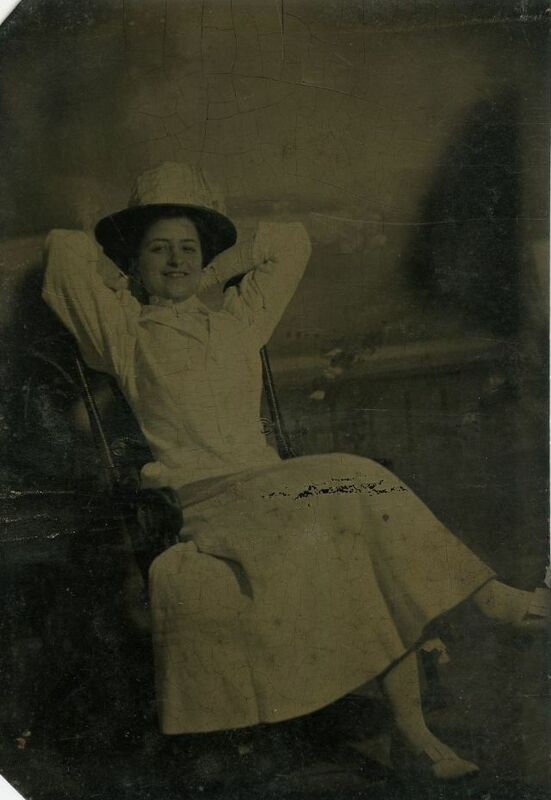 Relaxed and happy young lady tintype. 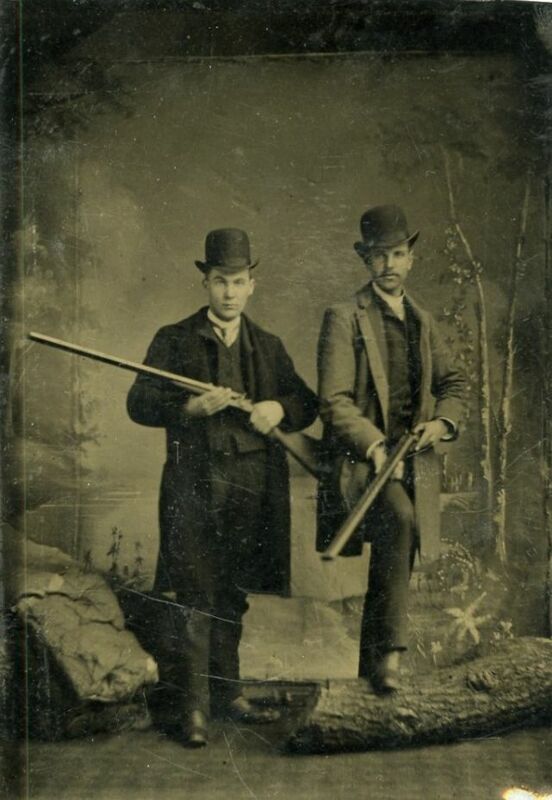 Two men with double-barrell shotguns. One has his gun open and is loading a new shell. 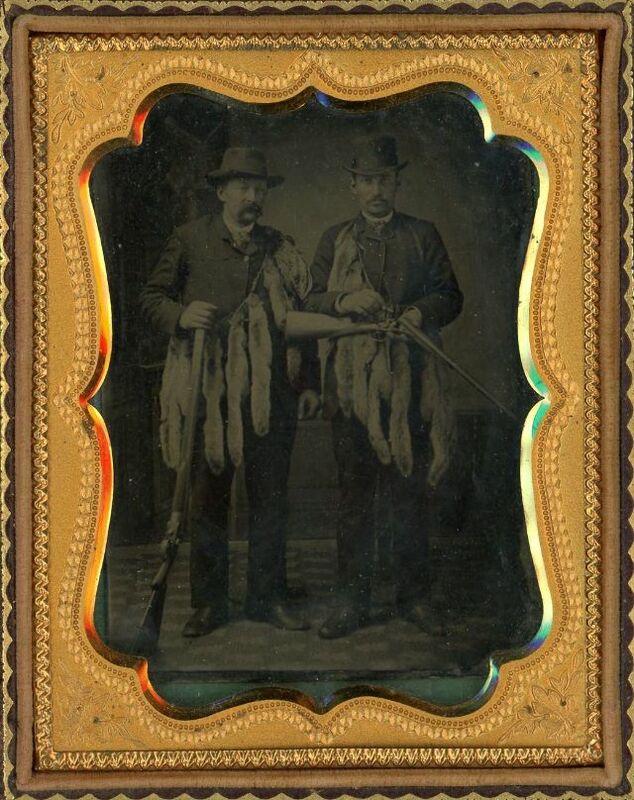 Both men are adorned with strings of dead squirrels. 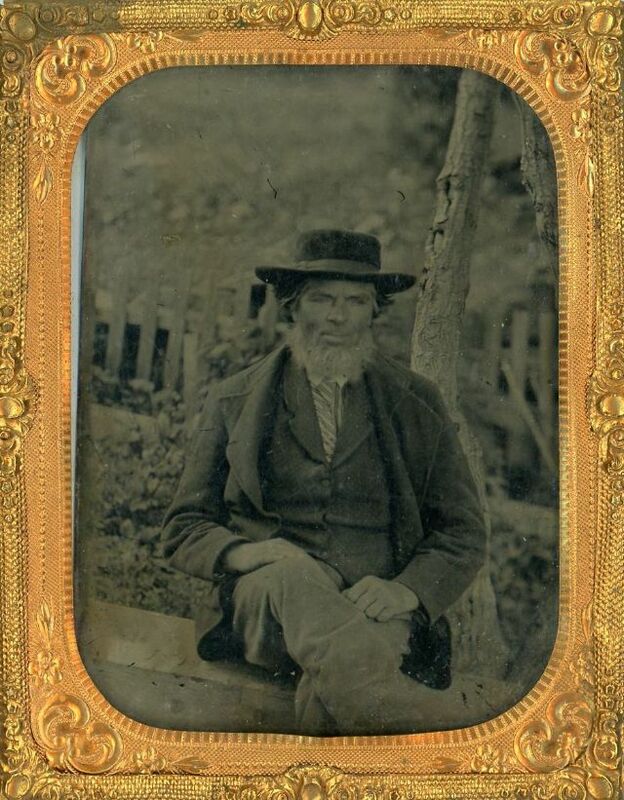 Gentleman with white beard, well dressed with hat seated outdoors. 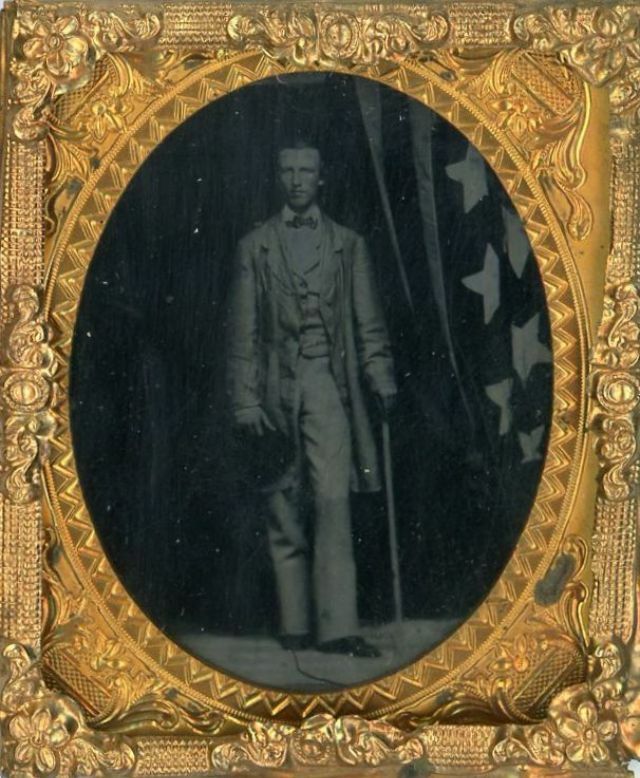 Tintype of full standing gentleman with cane and hat standing by a huge American Flag. Two western young men smoking cigars relaxing on the floor. 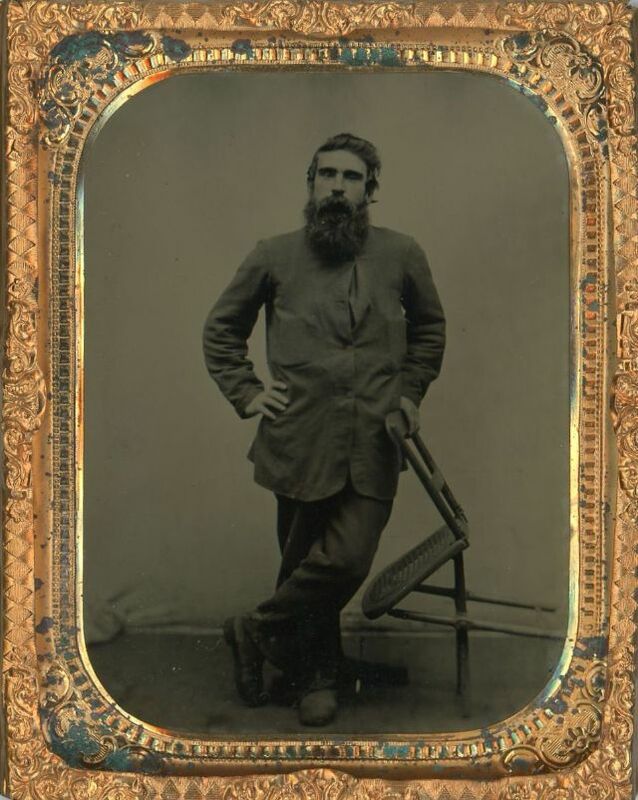 Quarter-plate tintype of an artistic looking man with long beard. His hand is on a chair which he is leaning toward him. This fellow could very well be an operator in the studio as he has that look and artistic outfit. But of course we will never know. 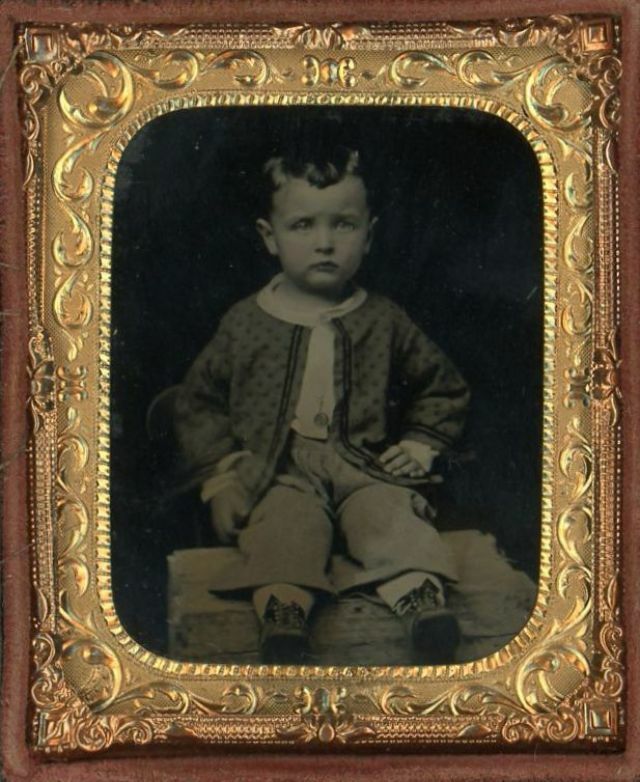 Ninth-plate tintype of very cute child, housed in a half leather case. 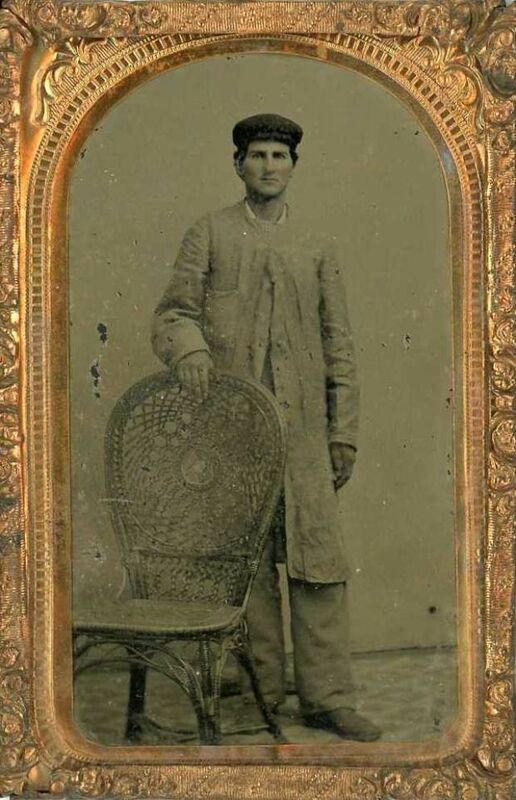 A young man in cap and smock, with his hand on a wicker chair.